I have been asked to put up some of my ROADKILL recipes. 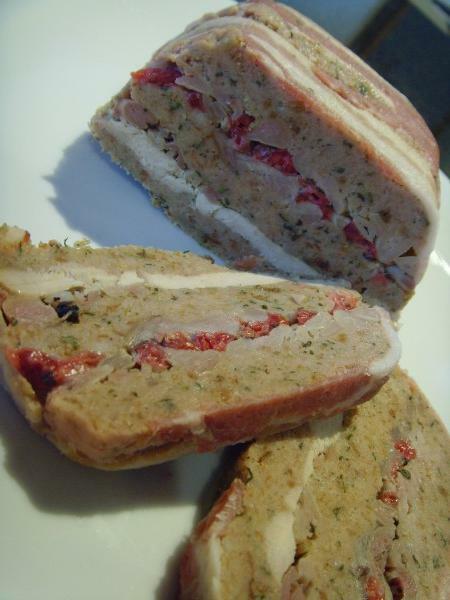 There are lots so I will start with one of my favourites… TERRINE!! It has humble beginnings as a hearty meal for French labourers, but is now served in upscale restaurants as a starter. Wild Game Terrine was one of the dishes I served up on Come Dine With Me earlier this year, alongside Curried Pheasant & Quinoa Roadkill Pies. I served two dishes as I wanted to spark a debate if my guests wouldn’t eat the roadkill, but would eat the butcher bought meat. My question was – so whats the difference? It was the same wild animal, the difference being one had been delliberatly shot with a gun, the other had been accidentally hit by a car! If it was a question of ethics, which one was the most humane? If it was a question of freshness, one had been hit by a car within a few hours, the other had been hung for over a week in the butchers shop…. which one would you eat? I hope you enjoy the following recipes! 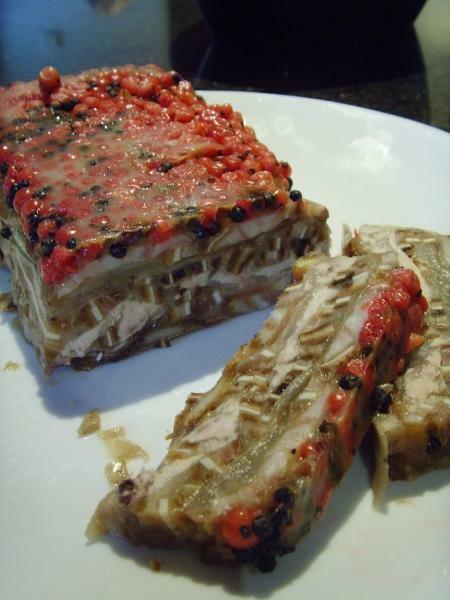 Since the meat mixture is best marinated and left in the fridge for a day, then cooked and cooled the next day and then left up to two days for proper pressing to occur, terrine is a time-consuming dish. (Or whatever nature provides when using road-kill – however, the trotters are hard to find on the road!! LOL.) Use the breasts of pheasant, pigeon (or other bird) and saddles of rabbit or hare for the terrine; throw the rest of the game meat and bones into the stock pan, cook, cool and pick clean the bones, you can freeze the meat bits for later to use in another recipe – or, include them in this dish). Herbs and fruits of your choice – for example; parsley, lovage, thyme and Autumnal fruits such as plums, apple or apricots! Be creative!! The gelatine removed from the meat is used as a preserving & jellying agent (as in the making of pork pies). Nowadays artificial gelatine is often added, but I prefer the traditional method. Mix (in a blender) the cooked meat, cooked livers, breadcrumbs, egg, parsley, thyme, juniper berries, wine/ brandy, season with the salt and pepper and mix together thoroughly with 4 or 5 tbsp of melted trotter jelly. This is the forcemeat. Press some herb leaves to the buttered base for decoration. Be creative!! Pour on a little of the warm, liquid jelly to bind the first layer! Allow to cool and set. When set, add a layer of forcemeat followed by a layer of game meat, and repeat this action until the game is gone. Again, when layout of the meat strips, be mindful, think about the finished pattern when it is cut into slices. Finish with a layer of the forcemeat. To serve, remove from the tin, guide the knife around the edges and tap upside down on a chopping board to release. If it doesn’t come out, pour some boiling water into a baking tin and warm the terrine for 10 seconds at a time, so the jelly begins to melt inside, but not so much that it melts the bulk of the terrine. When released, chill again and slice thickly while cold with a very sharp knife, clean the blade between slices. Arrange on a plate with the chutney and warm brioche. Gathering the fruits, jars, and the time consuming job of peeling, stoning and chopping is often made easier and more fun by working as a team. We all then get to share the end product. This was originally my amazing friend Tina’s recipe. She doesn’t really use weights and measures, but to make it easy she gave a ‘guess-timation’. 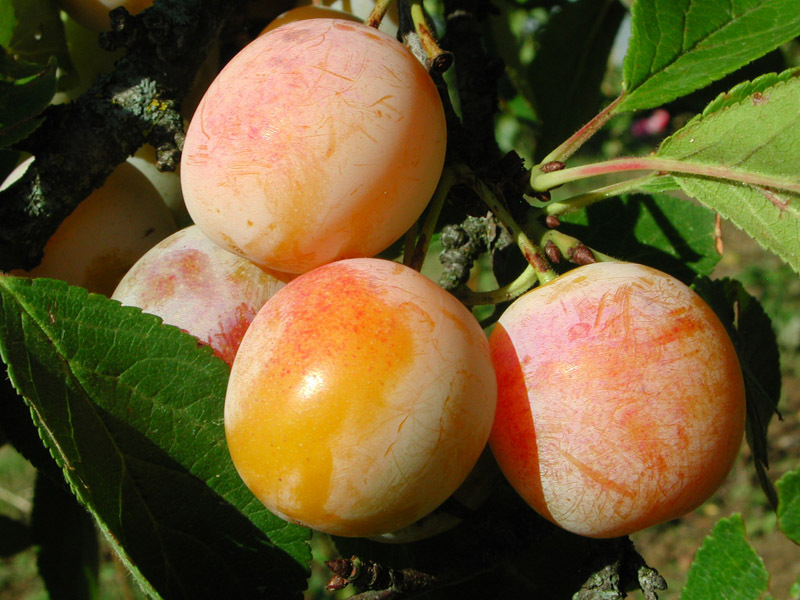 Wash, slice and de-stone your chosen foraged fruits. Put all the spices in a muslin bag. You can make one by cutting a large circle of muslin, putting all the ingredients in the middle and tying securely with a piece of uncoloured/ clean/ unbleached cotton or string. Gently soften the chopped onions in a little butter. Put the vinegar in the pan and add the plums and spice-bag. Bring to the boil, and then simmer until soft – about 15 mins is okay. Pour into hot, sterilised jars if preserving. Try not to use the dishwasher to sterilise your jars, it makes them smell. You can experiment with all of this in your own way of course…nothing is carved in stone when it comes to these kinds of recipes! It depends on what nature offers you at the time and your personal tastes! This terrine was made out of a pigs ear and a trotter! It was a beautiful thing to look at, and tasted damn good too, dipped in a chinese style sauce made from soy with ginger, garlic and spring onions…. mmmmmm! It was called “The Silk Purse Terrine”!